Much like Do Not Forsake Me Oh My Darling, Leesa is using the Ash Wednesdays show to test run her new rock project, Naked on Rollerskates. The skaters are currently in the studio putting finishing touches on a debut EP. 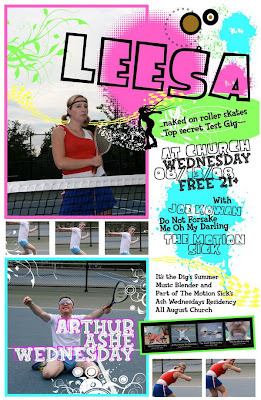 For this show, Leesa will be backed by The Motion Sick’s very own Matt and Travis on bass and drums respectively. The project is pretty hush-hush, but I did hear some tracks secretly recorded using spy equipment at the studio and they sound pretty awesome. We at The Motion Sick are all really looking forward to the release of the EP and really excited to catch the first real live run of the project this week at Arthur Ashe Wednesday at Church. In the meantime, you can make friends with Leesa on Myspace to keep an eye on her recording progress.